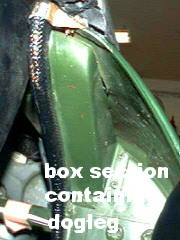 These photographs show one way of compressing the new seals between the MGB windshield frame and the body in order to line up the bolt holes for final windshield installation. This is a notoriously difficult job because of the way new seals want to curl up, so I hope this method helps you accomplish the task with a minimum of swearing. 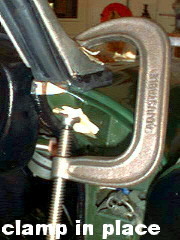 The 4" C-clamp is now applied and gently tightened until the holes line up inside the footwell. Problem is, you can't see whether the holes line up; it's done by feel. 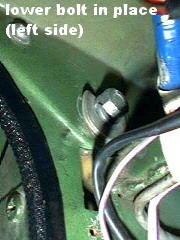 This is a view of the lower of the two bolts, once inserted. 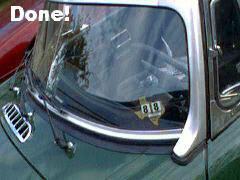 And the windshield is in place! 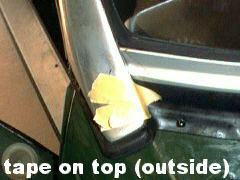 Comments on "Windscreen Seal Installation Tricks"
I used this method and I was able to install a new windscreen rubber by myself. That's the upside. 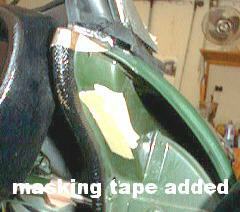 The down side was that is still took some muscle and a lot of wrestling to get things in line. An alternative I tried was to use ratcheting tie-down straps - from the top edge of the windshield to the lower dash bar - of course the dash was already removed. Photos and description are very difficult to see/understand. Using this method I also found using some slightly smaller diameter bolts as guides by pushing them in the holes helped while trying to line everything up, then removed one at a time and replaced it with the correct bolt made things much easier with a bit of jiggling.